let your company’s heart beat. OMTCO designs/redesigns business operations, mainly in service production. Operations are configured more efficiently and effectively – e.g. using limited resources to fulfill the requirements of internal or external customers. OMTCO offers line operations as a service. OMTCO employees have practiced line operations in the IT departments of large industrial and service corporations. implements and drives your strategy and operations. OMTCO supplements and supports your management currently in place, taking over responsibility. OMTCO offers business outsourcing in service delivery. OMTCO employees have management experience from different roles in the industry and service groups at their disposal. a main driver for operations and a lever for management. OMTCO covers main technology levers, i.e. 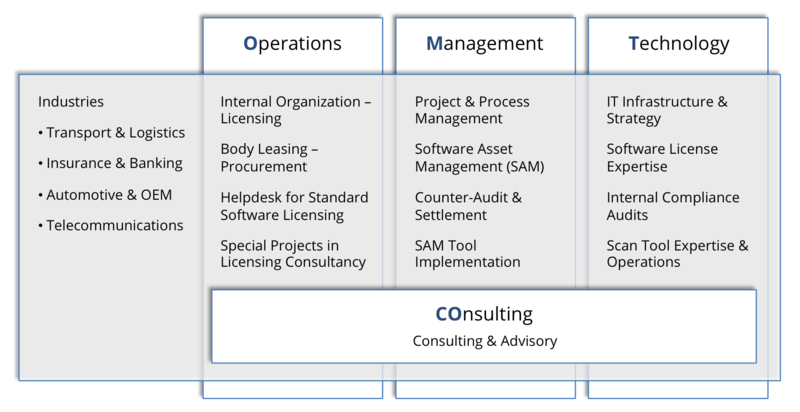 License Management, IT Architecture and Software Asset Management (SAM). OMTCO personnel bring in experience from many technological leaders. as temporary support – this is necessary whenever strategy, processes, organization, costs or road-maps are challenged. Many OMTCO consultants have been strategy consultants for major strategy consultancies. Should you wish for advice tailored to your specific needs, or to ask questions, please contact OMTCO at info@omtco.de or call your OMTCO representative directly.